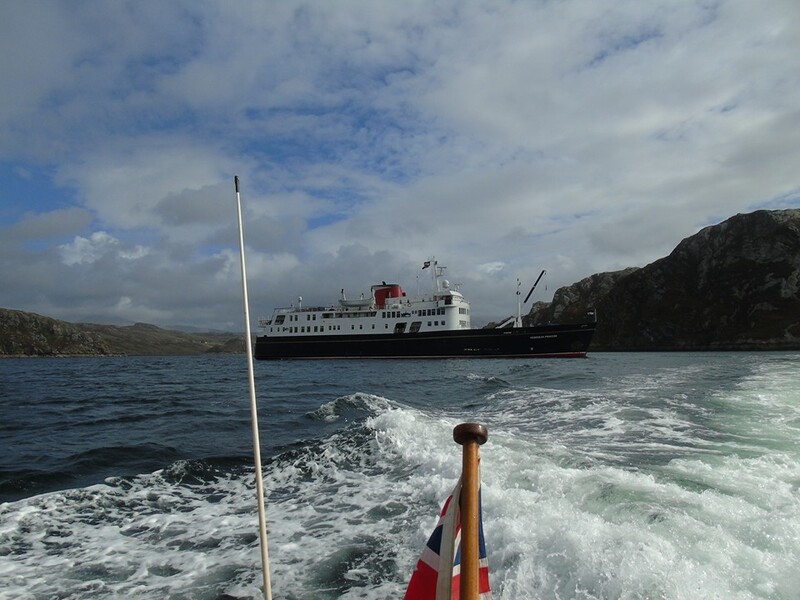 Relax and enjoy the comfort of Hebridean Princess as we cruise north to Kinlochbervie visiting inner isles and remote mainland villages through some of the most scenic lochs of the west coast. Today was spent alongside at Lighthouse Pier, Oban where our Captain, officers and crew waved a fond farewell to our disembarking guests. Our morning was spent cruising on passage to the Sound of Mull for an afternoon ashore in Tobermory to explore and indulge in a little retail therapy. The Farewell Gala Dinner was held at anchor off Java Point in the Sound of Mull. Following a relaxing sail south along the Inner Sound, we anchored in Loch Carron after lunch for afternoon walks ashore in Plockton. Our overnight anchorage was in Loch na Dal. This morning we landed on Tanera Mor, largest of the Summer Isles. Here guests enjoyed walks on the island and visited the Post Office for its unique stamps. In the afternoon we arrived at Ullapool for a visit to the Corrieshalloch Gorge where the River Droma flows over a series of waterfalls, the largest of which is the 46m Measach Falls. This morning we explored the remote Sutherland coast at Loch a'Chairn Bhain for guests to stretch their legs at Kylesku. During lunch we cruised to our most northerly point of Kinlochbervie for an afternoon visit to Smoo Cave at Durness, the largest and most dramatic coastline cave in Britain. We anchored overnight off Kinlochbervie. From Gairloch this morning's visit was the lush oasis of Inverewe Garden on the edge of Loch Ewe. Berthing alongside in Lochinver in the early afternoon, guests travelled to Highland Pottery to experience the hand made manufacture of ceramics. We remained alongside in Lochinver overnight. After a morning spent cruising the Small Isles, the Sound of Sleat, Kyle Rhea and under the Skye Bridge on passage to Shieldaig where guests were tendered ashore for walks around the conservation village. Our overnight anchorage was off Gairloch. Once embarkation was complete and the mandatory safety drill had been carried out we departed from Oban and sailed to our overnight anchorage in Bloody Bay, Mull.